Add a little camouflage to your outfit. 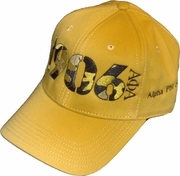 Our camo caps are twill with Velcro enclosure, and are fully embroidered with your founding year in vibrant colors. Add your greek letters and frat name, and you have your next cap!